The surface of your home deserves the grandeur you’ve dreamed of. 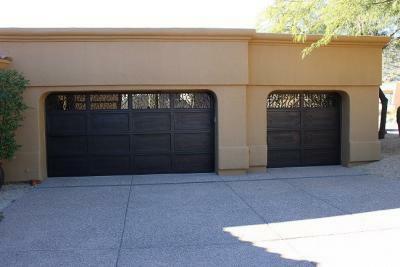 Why go through the effort to build a custom home without a custom garage door? Your garage makes up a high percentage of the surface of your home. Signature Iron Doors make that surface count. This family in Gilbert Arizona needed enough space for their family cars. These bronze iron doors enhance the beauty of their home with simple scroll work and reflective glass. Each panel is hand forged and finished. Each door provides astonishing aesthetic appeal as well as impeccable durability. Call us and come visit our showroom in Phoenix Arizona to discover how to enhance your new custom home with a Signature Iron Garage Door.